Banana bread seems to be one of those things that everyone absolutely loves, and because I've only recently started loving bananas, I'd never had it! I know, right?! But my workplace had a few bananas that were kind of okay but kind of brown, so I nabbed them and was inspired to bake a loaf. While mine is really unimpressive in comparison to some of the beauties you see on Pinterest, it's super duper flavoursome and light to eat, so it's perfect for breakfast or as a dessert! I only own one large loaf tin - all my others are mini tins - so I think that if I had something smaller, I would get a much more impressive rise. So please don't let my flat-looking loaf put you off, as your loaf tin may be perfect for it. 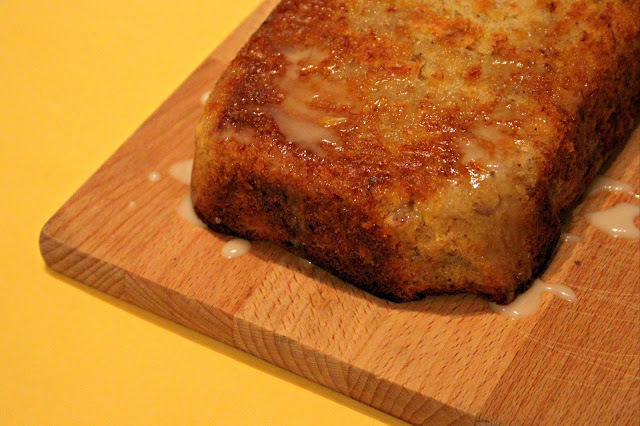 This is not just your average loaf of banana bread though, as it contains orange zest and is topped with a drizzle made from orange juice to give it a slight twist and a sticky crust. I feel like it shouldn't work, but it really really does. I also added in a few spices to give the loaf some warmth, so it's ideal for making in these colder months leading up to spring. Preheat your oven to 180c/160c fan/gas mark 4. Grease and line the base and sides of a loaf tin to stop your cake from sticking. In a large bowl, cream the butter and sugar together until they become light and fluffy. Add the eggs in one at a time, adding a little flour to the mixture with each one. Fold in the remaining flour, baking powder and the orange zest, then fold in the mashed bananas. Pour into your prepped tin and bake for around 30 minutes or until a skewer comes out clean. If you find that the middle isn't fully baked and the outer crust is beginning to brown to much, you can always cover the top of the tin in tin foil and place it back into the oven. Once baked, allow the loaf to cool for 10 minutes in the tin, then transfer to a wire rack to cool completely. Whilst the loaf is cooling, you can make the drizzle. Squeeze the juice from your orange into a small bowl, and add the icing sugar. Stir them together until they are combined and smooth, then you can drizzle it over your cake while it is cooling on the rack. Drizzling it over while the loaf is still warm will allow the drizzle to soak in slightly. And that's all there is to it! I didn't realise how easy banana bread was to make, but I'm so glad I gave it a try because I think I'm hooked. I can't wait to try out more variations and maybe even add chocolate chips next time.